I'll get the boring stuff out of the way right now - my name is Joe and I'm a newbie to tiling but in a former career was a construction superintendent (my finish carpentry skills being somewhat deficient my employer had to put me somewhere where I could be useful). Thanks to the incredible wealth of information available on this site and John's new book, I feel well-prepared to tackle a major remodel of my master bathroom. I'll be starting it at the end of this month (April). Wish me luck! I hope to be able to practice the fine art of "standing around" with some style. I plan on ordering a Kerdi shower kit from Tile-Experts.com. I'll be using Ditra for the main floor outside the new shower area. I hope it is as easy to use as it looks. (Yep, been to Schluter's site, viewed all the videos). I'm lucky to have 2-1/2 baths so taking one out of commission isn't a real problem for me. The bathroom that is scheduled for an overhaul is appr. 9' x 8'. It will have one 3' x 4' shower with a full bench against one of the 3' end walls. My wife and I picked out our tile today, surprisingly this went very well and we both agreed on color, size, etc. without any arguing! I'll post some pics once I get moving on the remodel. Thanks again to everyone that has shared their knowledge in these forums. You have done your homework and came upon a great approch with the Schluter products. One thing that we joke about but is a must is the patience to stand around and take your time. If you let the project proceed at its pace rather than what you think the pace should be you will be quite satisfied with the results. Hi Joe, Welcome and thanks for buying the standing around book. 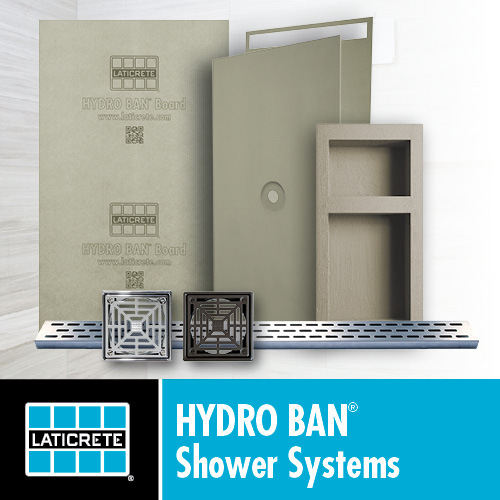 I argue all the time with David Taylor, the Tile-Experts guy, about the use of the Kerdi-tray as a shower floor in showers that it doesn't fit into. Do they have a 3x4 tray? If not, I would not order one. You are better off using mortar to make your own floor. Sounds like a straight forward project. Yes, Ditra is as easy to work with as they claim. Steven, no problem about taking my time. I've learned my lesson in the past about stopping once "the attitude" kicks in. Best to take a breather and pick up work again the next day. John - I was just about to order the shower kit. I was already a little bit worried about using the tray from the kit because it would have to be cut. Not having seen the material up close it is tough to make a decision on whether I should go with it or do a regular mortar preslope and Kerdi over it. Comments, pro or con, would be appreciated. For my particular shower I would need to trim a total of 12" from the kit's tray. (The standard tray is 48" x 48" in two separate panels). I also have a question about my bench. Because I will be using Kerdi, I thought I would frame my bench from 2X4 and sheath with plywood. Once covered with the Kerdi this should be sufficient? If you can cut equal segments off the tray all the way around, it will work, but cutting one side off or cutting two sides off leaves you with a perimeter that is not the same height all the way around. I would go with the mud. It's not that tough. Just order the drain and enough Kerdi to do the floor and walls up to the height of the shower head. The seat can be framed and coverered with plywood. Just make sure you put plenty of lumber in it -- make it strong. I considered the Kerdi tray myself, but suggestions from this site brought me back to trying it myself with a mortar bed. It wasn't that hard to do, and it came out great, in my opinion. I could not have done it without John's and everyone elses help at this forum. Take a look at my project and see how I did it. I also framed my bench in 2x4 with plywood and cement board on the seat and drywall on the face. It hasn't stood the test of time yet, but I am convinced it won't leak! Another question on the bench. Do I build it in place and Kerdi down the wall and over the bench or should the Kerdi go all the way down the wall behind the bench as well? Maybe I should do a "monument bench" instead. Doing the monument bench method I would do my preslope, Kerdi everything and then build the monument bench on top of the Kerdi right? I like the monument bench idea, definitely would be solid. I'll post my floorplan and such as soon as I can. Thanks for the great info so far. I think either way will work, but let' see what the pros think! I applied Kerdi to all my walls first, and then built my seat in place on top of my plywood floor. Then I applied Kerdi to all the seat surfaces and seat/wall connections. I then installed the mud floor, applied Kerdi to the floor and the floor wall connections. I like the method you described. My bench is a little larger - full length - 36"W x 12"D x 18"H. I'm tempted to build the monument bench, wouldn't have to worry about it collapsing and all. Okay, you can do the monument before of after you install the Kerdi. You can either waterproof the shower and build the bench inside the membrane, or you can build the bench and cover it when you install the membrane on the walls and floor. Either way it won't leak. You might want to do the latter just to ensure no water gets into the bench. You've done your homework, I think your a prime candidate for a very fine project outcome. I don't see any reason not to do a monument-style bench in a Kerdi shower after having Kerdied everything. I'm not sure, though, that I wouldn't build my bench first and then Kerdi walls, bench, floor, everything after the fact just because it keeps water from ever getting into any part of the shower structure, including the masonry bench. As for Dave's sequence of applying the Kerdi, I think one of the things Schluter advertizes is that it makes no difference what sequence it's done, nor what part overlaps what other part, so long as the overlap is at least two inches and properly applied. I would feel compelled to shingle everything uphill, just because that's the way I've been trained to do any kind of waterproofing for lo these many years, but apparently Kerdi don't care a whit; just make nice tight joints. Oops, I see the boss slipped in there with that information. At least he got it right. You guys are very helpful. Thanks to everyone for all the advice. I've decided to go monumental with this and follow John's (and cx's) advice to build the bench in place then cover everything with Kerdi. BTW, I just ordered a Felker TM-75 from ConstructionComplete.com, couldn't beat the price and free shipping. Last edited by jgleason; 04-04-2004 at 04:33 PM. Wow. Everyone beat me to the punch. I can't say any more than what's been said. What town are you in, Joe? The best result of a quality installation is a good night's sleep. www.tile-experts.com -- Get Schluter products, like DITRA and KERDI, plus live help! I'm in Weare, NH, about 15 minutes west of Concord. The tile-experts site is great, I'll probably be ordering the Kerdi stuff in the next day or two. Just rechecking my dimensions before placing an order. Here's my planned bathroom layout. Please feel free to comment. I'm open to suggestions as well as gratuitous compliments! Seriously, any comments are appreciated, I'd rather do this once and it is possible that I've missed something that will make this layout even better.